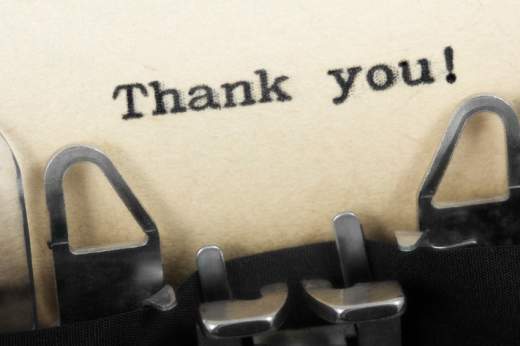 A few weeks ago, a reader commented that I had not posted a Thank You Thursday (#TYT) post in several months. He was right, and I’ve been thinking about it ever since. I had posted so many TYT posts that I felt it needed to be something really special. Something uncommon. Something uniquely me. Of course, that is not the point of gratitude! It’s really about recognizing and honoring the many big and small things we all can be grateful for in our ordinary days. And, this week, it’s no different. This is gratitude for something – or should i say, someone – we all see everyday. Today I am thankful for the first responders who put their lives on the line for our safety. Emergency Medical Technicians. Firefighters. Police Officers. 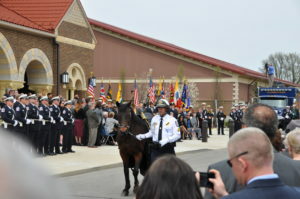 On Tuesday, I attended the services for Officer Steven M. Smith, a Columbus SWAT officer killed in the line of duty. I did not enter the church (thousands of officers deserved that space) but positioned myself with other ordinary citizens just outside the church. Even now, as I write this 24 hours later, I still struggle with how to describe it. Below are random observations and a few of my photos. I spent most of the four hours before during and after the service with a couple who had several family members serving as police officers. 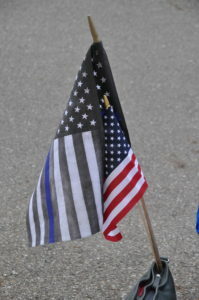 They carried an American flag and a “Thin Blue Line” flag, explaining the symbolism to anyone who asked. They, like me, simply wanted to pay respects and show support. “There but for the grace of God go I,” the woman said as we chatted. It could happen to any first responder family on any call, any day. People often comment about the sad sound of bagpipes. For me, it was the drums that accompanied the pipes. Low and loud. Steady and strong. Pounding like a heart committed to life, an ironic sound at a funeral. The riderless horse, draped in black, stood waiting for its moment for nearly three hours. 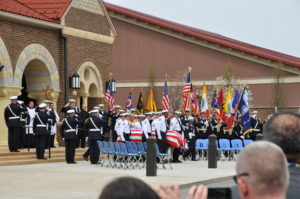 As it was led past the grieving family at the outdoor portion of the ceremony, it turned its head the other way, perhaps not wanting to see the overbearing grief we could all feel. It took at least twenty minutes to empty the church and prepare for the outdoor ceremonies (there was to be no graveside service). 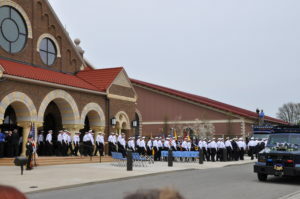 The seemingly unending line of officers in dress uniform was an incredible tribute. There were officers from as far away as California, Nevada and New York. 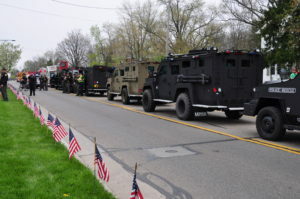 During the inside service, I wandered back down to the street and was astonished by the number of SWAT vehicles and officers lined up and down the street. 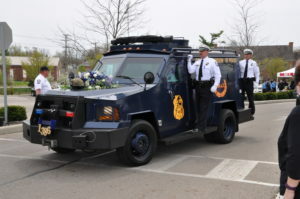 Again, departments all over the state had released their vehicles and officers to attend the funeral. At one point, the pipe and drum band played Amazing Grace. As is tradition, one piper then played the song solo, walking off to the distance. As the sad music faded, it was replaced by the increasing sound of sniffles as tears were flowing. That’s another sound I’ll remember. Helicopters circled overhead all day. I think it was a combination of SWAT and local media helicopters. 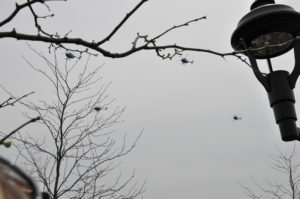 But then, near the end, four copters flew in from the south in formation. As they arrived over the church, one of them broke rank and flew off on its own; the “Missing Man” tribute. After the flag that draped the casket was folded and presented to the Columbus Police Chief, all police were called to attention. Chief Jacobs slowly walked over to the Smith family, got down on one knee, and presented the flag to them. We don’t know what she said, but I imagine that, on behalf of a grateful community, she thanked the family for Officer Smith’s outstanding service. There was the traditional last call to duty. Officer Smith’s badge number was called out, I think it was twice. Upon hearing no response, Officer Smith’s badge was declared to be out of service. Silence. Sadness. Before the SWAT vehicle carrying Officer Smith’s body left to return to the funeral home, fellow SWAT officers climbed aboard, standing on the sides and rear of the vehicle to accompany him on his final journey. A woman stood near me with her five year old grandson. She thought it was important for him to honor the police officer and she patiently explained what was happening throughout. At one point, a member of the Pipe and Drum Corps came over and shook hands with the little boy. “Thank you for coming today.” I’m sure that moment will stay with him for years to come. 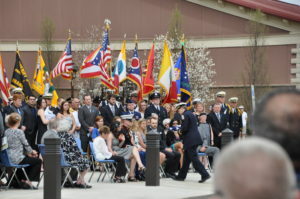 If you ever have the privilege of attending or observing the funeral ceremonies for a fallen police officer, pause the rest of your life and go in support. Until then, join me in gratitude for the protection they give us, the risks they take, and the sacrifices they and their families make. Our unending thanks is the least we can give.